Unlined jacket has shawl collar, front and back neck facings, shoulder pads, side seam pockets tacked to front facings, and bias bound seams. Loose fitting top has front slit and back neck opening with hook and eye, neck and armhole binding, and topstitching detail. 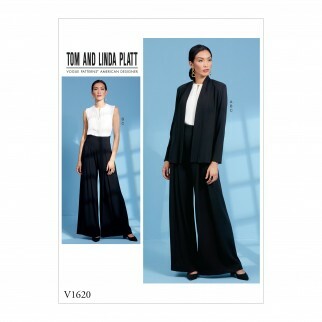 Pants are very loose fitting through hip and worn above the waist, and have waist facings with boning, front pleats, back darts, and invisible back zipper. Fabric suggestions include: Crepe Jersey, Satin Back Crepe, Linng: Charmeuse, China Silk.